Looking forward to ice fishing? Like you, I am looking forward to waves surrendering to a lengthy siege of ice. When this happens, the bluegill will be the fish that you, I and others catch and keep the most. 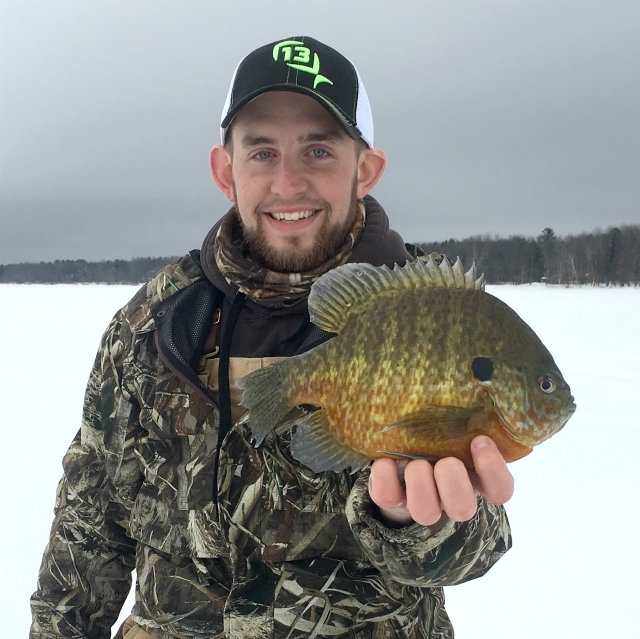 And because that’s the case, I thought I’d share some insights on bluegills and ice fishing. In Minnesota, ice fishing is more popular than ever. Anglers are fishing longer because of comfortable wheeled and pop-up houses. They are fishing smarter too because of ever-improving electronics. The ability of anglers to zero-in on fish-holding structure has never been better. How many bluegills get caught in a year? According to the Minnesota Department of Natural Resources, a conservative estimate is about 14.1 million. That’s a huge number yet not surprising given Minnesota has about 1 million resident anglers, 400,000 visiting anglers and plenty of young anglers under age 16 who do not need a fishing license. Moreover, you can fish bluegills year-round, which is far longer than many other game species. Since it is hard to imagine what 14.1 million bluegills looks like, let me help. If you assume the average “keeper” is seven inches long, that is 1,546 miles of sunfish placed head-to-tail. That’s roughly the distance of a road trip from Minneapolis to Maine. As a result, it is also not surprising that the average size of sunfish has decreased over the past 50 years in most Minnesota lakes. The two primary reasons are stunting and overharvest. Stunting happens when the number of sunfish is high, their food supply low and predators are few. Overharvest occurs when big sunfish are harvested faster than nature can replace them. Releasing (or keeping fewer) large bluegills so they continue to grow and breed. Fishing sunfish nesting areas. Adult bluegills are especially vulnerable to anglers in spring. Protecting bluegill habitat by maintaining native plants along shorelines. Please give the points above serious consideration. These days, the average sunfish is about six inches long and weighs about a fifth of a pound. Fewer than three percent of lakes contain bluegill 10 inches or longer, according to the DNR. So, have fun this winter but be thoughtful. An 8-inch bluegill is the equivalent of a 22-inch walleye, 30-inch pike or an 18-inch largemouth bass. Don’t forget to get your MN fishing license online before your next fishing trip.